The latest Detective Pikachu TV spot features some funny Pokémon merch. Ryan Reynolds, who voices the titular character, shared the latest look at the movie this morning and notes that he has the Pikachu bed that is seen in the new spot. 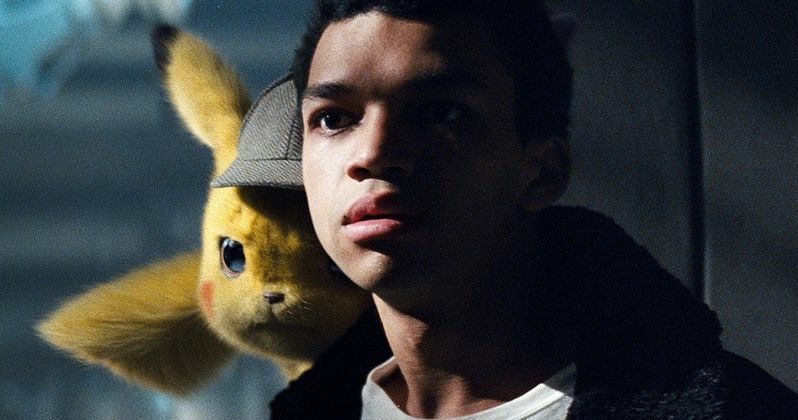 The highly anticipated movie takes place in a world where the Pokémon franchise is just as big as it is in the real-world, except the monsters really exist, which leads to a pretty awkward scene for Pikachu and Tim Goodman (Justice Smith). Most of the Detective Pikachu TV spot shares footage that has been seen in the previous trailers. But, there is a scene at the end where Pikachu and Tim Goodman end up in his childhood bedroom, which features a Pokémon bed with Pikachu ears. The Ryan Reynolds-voiced character is flattered by the discovery, but also admits that he is a bit "creeped out" by the whole thing. It's a pretty funny short scene that will probably be extended when the movie hits theaters. It also gently mocks Pokémon fandom, which will more than likely be a key piece to the project. Though he probably doesn't really have that bed, one could see Reynolds actually owning it at somepoint in his life. Tim Goodman was once an aspiring Pokémon trainer in his childhood, which would explain his Pikachu bed. However, Tim's dreams never ended up panning out, but he later finds himself on a mission to find his missing father with Detective Pikachu at his side, though he rather that the little yellow monster walk instead of doing the shoulder perching. While annoying to Pikachu, he is able to get some exercise as a result and more exercise is always a good thing, even for Pokémon monsters. Detective Pikachu hasn't been released yet, but it is already getting comparisons to Who Framed Roger Rabbit and has its eyes on a big opening weekend at the box office. This is obviously due to the strong promotional material that Warner Bros. has been putting out. After the first trailer dropped, many people who weren't interested in seeing the movie suddenly took notice. There are plenty of self-aware jokes, which makes sense since it stars Ryan Reynolds and it will have some heart, but for now it looks weird and funny. Detective Pikachu hits theaters on May 10th, which is a few weeks after Avengers: Endgame. This should allow the movie to gain the number one position for its debut weekend, where it has been estimated that it will earn anywhere from $75 million to $90 million. Even if it ends up at the lower end of the spectrum, this will still be a victory for Warner Bros. Plus, we've still got quite a while before the movie opens, leaving plenty of time for more promotional material that highlights the strengths of the movie. You can watch the latest Detective Pikachu TV spot below, thanks to Ryan Reynolds' Twitter account.